If you were at Oracle OpenWorld this year you might have had the chance to preview Oracle’s latest cloud service – Oracle Management Cloud (OMC). The three OMC services launched this month are Application Performance Monitoring (APM), Log Analytics (LA) and IT Analytics (ITA). The goal for OMC is to bring together different types of operational data for use by both businesses and IT. All data is stored in a unified data platform that allows you to navigate from one service to another while working on specific use cases. Here’s a quick overview of each service to get you up to speed. This service gives you insight into the end user performance and experience, from browser statistics to AJAX calls. With statistics on page load times and errors, you can drill down to find errors, see the request calls, and review memory usage and garbage collection. 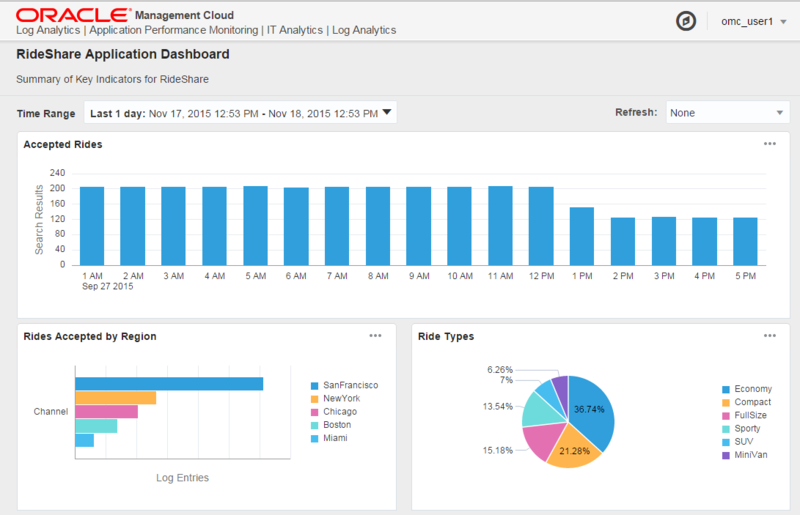 The integration with Log Analytics allows the user to drill down to server and application logs related to the poor performance time periods. By using saved searches and creating custom dashboards you can see the information that’s important to your application in one view. Upload all your logs to the cloud – database, application, middleware, server, infrastructure – then search and explore to identify problems or resolve issues. Troubleshoot problems by exploring logs in context of the application using topology-aware log exploration. 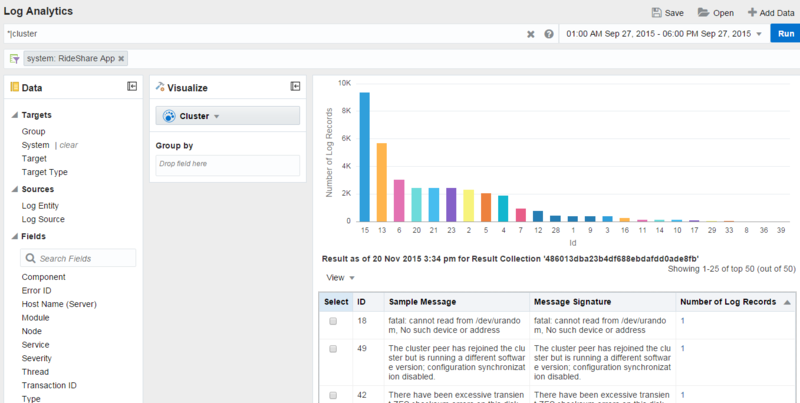 Then utilize the cluster feature to identify outliers or frequently occurring patterns. There’s always a lot of noise in log files, so this allows you to filter out the noise and get to the real errors that you need to see. Another key feature is the ability to correlate other logs within a time period. Let’s say you found an error at 1:00, you can then see the log entries 1 minute before and after on different systems to identify any correlated log entries. LA also includes the ability to save queries and use them in a dashboard so you can replicate your searches with ease. Not to mention storing logs in the Oracle cloud instead of on your servers for long periods of time. Finally a way to look at IT resources holistically and see how targets in your environment compare to one another. Resource Analytics will allow you to view current utilization as well as forecast things like storage and CPU across targets, or groups of targets. Answer questions like how much storage will we need in 6 months? How about what databases are consuming the most CPU and how much have they increased recently? With Performance Analytics you can identify bottlenecks across Database or Middleware targets. Have you ever wondered what the worst SQL in your environment is? I had a manager once who really liked to point out the worst performing SQLs across applications, how easy this will be now! Probably the most exciting feature is the Data Explorer which allows you to create custom queries and save them as a dashboard that you can create for your unique requirements. Below I’ve searched for database instances based on their DB Wait time, hovering over the chart you get a popup with the target, type of wait and value. I can now save this widget to a dashboard if I like. More information on OMC can be found in this ebook from Oracle and on the Oracle Cloud website. You can also watch the launch video here. I will be posting more about each of the services over the next few weeks, as well as sharing my experiences with our first customer implementations, so stay tuned!